Competitive Edge Products, Inc is delighted to present the excellent Tanita BF-684W Body Fat & Body Water Scale. The Tanita BF-684W Body Fat & Body Water Scale monitors your body fat through essential information from the comfort of your own home! By tracking your body fat on a daily basis, not only can you make adjustments as needed, but you can also track your inner health as well. With a large, wide, sturdy, platform weighing up to 440 pounds, the Body Fat & Body Water Scale is easy to use. Measuring in increments of 0.2 pounds, this scale provides accurate information any time you want it. The large, blue back lit LCD screen makes reading results simple. The 2 person memory will keep track of your information so you don't have to! The sleek, modern, white design of this scale is sure to blend in with any decor. 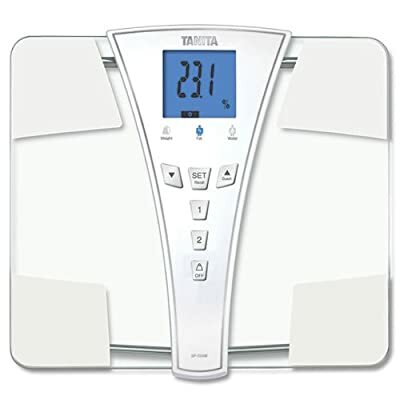 For this great price, the Tanita BF-684W Body Fat & Body Water Scale is highly recommended and is a regular choice for most people. Tanita has added some nice touches and good value for the money. Body fat monitoring is an essential tool for precisely measuring your body's inner health. Tanita Body Fat Monitors provide vital in-depth information, that allows you to accurately observe the impact of a diet and fitness program.